Described as 'the Catholic church's best kept secret,' Catholic Social Teaching provides a rich body of thought, and finds a particular resonance as all denominations in the church seek to engage with the needs of contemporary society. Yet beyond the immediate context of the Catholic church, it is all too readily ignored. "When Justin Welby referred to Catholic Social Teaching as, 'one of the greatest treasures that the Churches globally have to offer,' not only was he correct but also speaking for many of us who aren't Roman Catholics. Too many Christians are still unaccustomed with this rich vein of Church teaching, though. Into that void steps Fr Simon Cuff as an able guide. He takes us on a whistle stop tour of vital concepts such as solidarity and human dignity and demonstrates their urgent need in today's politically febrile atmosphere. Vitally, he roots this teaching in practical examples from his own experience. A book for leaders, both clergy and lay, in all Christian denominations who are concerned with God's heart for justice." "Many may have heard of Catholic Social Teaching, but wondered what it is and why it matters. Simon Cuff has written a lucid, well-researched and accessible introduction to this important strand of thinking which helps the church engage critically and constructively with the life of the societies in which it lives." 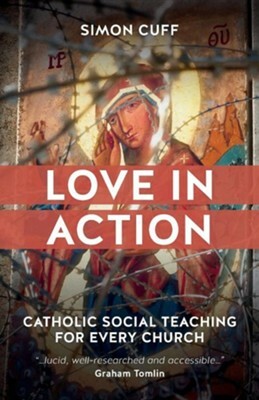 I'm the author/artist and I want to review Love in Action: Catholic Social Teaching for Every Church.